The nomination of Narendra Modi as the chief of campaign committee of BJP for 2014 elections (June 2013) has created more than a storm in the tea cup. Incidentally it is the first time ever that such a nomination has created 24x7 news and controversy. It has a lot to do with the propaganda machinery, which Modi has created around him. The atmosphere being created is that this nomination is like being nominated as the Prime Ministerial candidate or a prelude to it, which may be true. The major opposition to this came from Modi’s own mentor Lal Krishna Advani, who for quite some time has been the one to promote and protect Modi. It is his politics due to which Modi has his present stature and power within BJP and in Gujarat. Advani was the one to suggest his name as the Chief Minister of Gujarat, when Gujarat’s political fortunes were declining, and Modi revived those electoral fortunes, the linkage between carnage 2002 and Modi’s rise to power is a matter of conjecture. With the discernible role of Modi in Gujarat violence, the then Prime Minister Atal Bihari Vajpayee wanted Modi to be sacked but it was Advani, who saved Modi’s skin. Even earlier it was Advani who promoted Modi to the forefront. 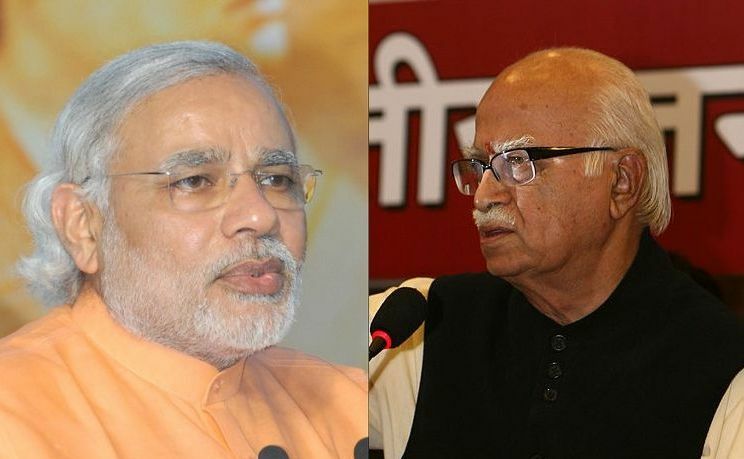 The reason was nothing personal; it was the matching political agenda of both these swayamsevaks, Modi and Advani, who were working in tandem to enhance the creeping communalism in the polity of the nation. They are swayamsevaks of RSS and have been major players in the RSS agenda of Hindu Rashtra. Advani, having brought BJP to the forefront from two seats in 1984 Lok Sabha elections to the later 161 in the post Babri demolition elections and to further peak of 182 in 1999, with the further polarization. Advani’s communal actions catapulted BJP and it became the major opposition party and then came to the seat of power in Center for close to six years. Advani, being a shrewd politician knew that though he is the one responsible for the BJP’s enhanced fortunes, he also realized that his divisive actions will prevent other political parties to enter in to an alliance with BJP. It is because of this that he pushed forward the name of a fellow swayamsevak, Atal Bihari Vajpayee, who managed to keep a moderate image despite having the same agenda of Hindu rashtra. After Vajpayees innings as PM, Advani’s Prime Ministerial ambitions forced him to adopt a moderate image. The demolisher-in-chief of Babri mosque started making moderate noises to the extent that he picked up Jinnah’s speech in Pakistan Constituent Assembly on 11th August 1947, to call him a secular leader. This speech alone cannot be the base of evaluating Jinnah, as it is the same Jinnah, who was the Chief of Muslim League and he was the one who gave the muscles and teeth to the communal ideology of ‘Two Nation Theory, the ideology which was shared both by Hindu and Muslim communalists. Calling Jinnah secular was probably overkill as by that time RSS combine had consolidated the Hindus around ‘hate Muslims and hate Jinnah’. To swallow this statement from Advani was a bit too much for the patriarch, RSS, and so Advani was dumped. RSS as such also wanted a change of guard keeping the age factor in mind. For the lack of any credible face, Advani had to be resurrected again for 2009 general elections. As such RSS had also some reservations about giving the command to Modi as RSS wants the primacy of organization over individuals. Modi overshadows the organization to which he belongs. But in case of Modi, RSS seems to have made an exception as Modi has cultivated his appeal through carefully constructed propaganda and through the communal polarization brought in by his role in the Gujarat carnage. RSS politics is an Indian version of supra authoritarian politics, couched in the identity of religion, it’s a sort of fascist politics. Fascist politics needs a charismatic mass leader, so in deference to the political contingency RSS has loosened its reservations about Modi and has to accept his uncontrollable rise. In the whole drama, as it is unfolding, the divisive image of Modi is making other NDA allies to shift away from BJP. These allies have to nurture their own constituencies amongst minorities, so they cannot easily accept the leadership of Modi. So the already deflated NDA will be further deflated and barring the diehard Hindutva Shiv Sena and communal Akali Dal all others may desert the ship which is likely to be captained by Modi. In this case what is noteworthy is the role of RSS. While Advani raised the banner of revolt, it was only a phone call from RSS supremo that Advani did a climb down. For swayamsevaks trained by RSS, there is no question of defying the dictates from Nagpur. This is for number of reasons. One that these swaymasevaks are taught that their primary loyalty is to RSS and Hindu Rashtra. One recalls that when the previous avatar of BJP, Bhartiya Jansangh merged into Janata party after the lifting of emergency in 1977, the other constituents of Janata party asked the Jansangh members to severe their links with RSS. The Jansangh components broke away from Janata Party leading to split in Janata party and retained their umbilical cord and their ideology with RSS. Atal Bihari Vajpayee the supposedly moderate face of BJP, in Staten Island, in US, while talking in to the NRIs reaffirmed that he is primarily a swayamsevak and later a Prime Minister. Apart from ideological factors there are electoral factors which are operative as well. The main strength of BJP at electoral level comes from the RSS volunteers, who sweat it out to make their nominees win. The organization of BJP is tightly controlled by RSS through the organizing secretaries of BJP, who are the nominees from RSS. RSS felt rewarded as Ram Temple issue picked up, Advani’s divisive Rath Yatra led to series of acts of violence and communal polarization went to higher levels, which were electorally profitable to the Hindutva politics. Today the stage has come where on one hand the BJP has been declining in the electoral arena and on the other the regional parties are coming up with big strength. These regional parties are more focused on their local issues, so one does not know which way they will turn after the election results. The whole episode has demonstrated two major things. It has shown the polarizing impact of Narendra Modi. People also perceive that he is dictatorial in his attitude and when in power he is capable of usurping all the power to himself. This authoritarian character is being projected as his being ‘powerful’. The other leaders in Gujarat have perceived it and ex BJP leaders have either been marginalized to the full. One cannot be very hopeful about the attitude of the regional and other parties out for keeping power irrespective of values. One recalls that when BJP emerged as the largest single party in 1996 no other party was willing to ally with it. But just a couple of years later so many of these parties hovered around BJP to share some power as NDA. RSS-BJP-Modi may be banking on this historical experience to woo the other parties, still it seems a difficult task as at that time the sobering presence of Vajpayee was instrumental in making the other parties fall in to delusion and have the some part of the cake of power. Today the challenge for secular movement remains quite mammoth. The ‘social common sense’ is heavily biased against religious minorities, their plight is becoming close to second class citizens. The threat of Modi coming to power does not seem imminent but one cannot say what role BJP-RSS combine will play to come to power. Earlier also one has seen that after every communal violence, the communal formations become stronger. Communalists know it too well. It is a dangerous portent for the country. The simmering acts of religious violence are strengthening the communal forces at grass root level. What about Federal front of regional parties? It will be like a sack of potatoes, with so many prime ministerial aspirants and diverse political agendas. What about third front? Can it come up as a coalition of all and sundry? The third front can be viable only on the ground of democratic, secular and pro poor programs. Who can take the lead for that is the million rupee question. While dumping Advani and selecting Modi, RSS has given a clear signal that it is going to orchestrate the aggressive Hinduta, authoritarian leader with fascist agenda and to try to impose Hindu rashtra on the secular democratic India. The creeping fascism hidden behind the persona of Modi and the organization called RSS needs to be engaged with in right earnest on democratic grounds.